Can My Resume be Replaced With A LinkedIn Profile? Having a strong LinkedIn and digital presence is key to the success of your job search. It boosts your visibility to hiring managers and recruiters. It provides a valuable opportunity to connect with industry peers. And gives access to relevant job opportunities through LinkedIn’s job board and industry groups. But make no mistake, LinkedIn is a professional networking platform, a tool designed to complement your resume, not replace it. Most job postings still require that you upload an actual resume and cover letter document to apply to a position. In some cases, you may be able to use your LinkedIn profile to apply to job opportunities through LinkedIn’s own job board. But rarely is that the case for outside platforms. Therefore, it’s important to have a strong resume and cover letter individually tailored to the role and organization you are applying to. How much detail should your LinkedIn profile include? I’ve seen profiles ranging from nothing but job titles and company names to a full cut-and-paste of the resume content. The most effective profiles land somewhere in the middle, in terms of the volume and descriptiveness of content. Include a strong, keyword-optimized headline that describes your focus and area of expertise. Create a brief opening summary or short bio that introduces who you are, what you’ve done, and what you have to offer. Your job descriptions should include your current title, employer, dates, and location, as well as a brief paragraph or two describing your position from a high level. You can include additional sections such as Education, Certifications, Projects, Publications, and Volunteer work. Boost your profile by asking your connections for recommendations on your work. Diversify the mix of recommendations across peers, supervisors, clients, or direct reports to showcase your various working relationships. Much like the resume, the LinkedIn profile should be clear, concise, and easy to read. Too much content will lose your reader’s attention. Not adding any content is a missed opportunity to grab their attention and start a conversation. 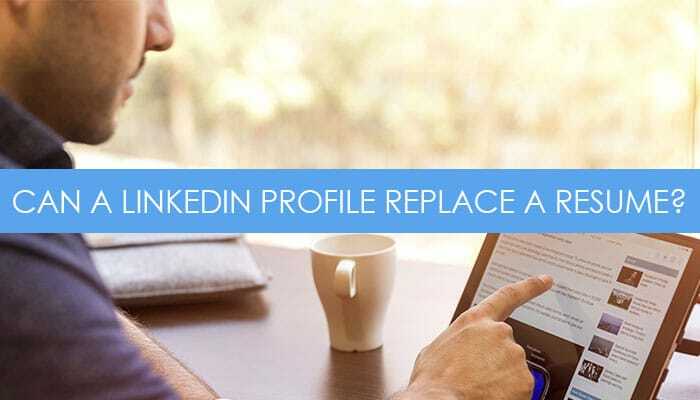 LinkedIn relies on something called a Profile Completeness Score, which is essentially an algorithm that evaluates the relevance and legitimacy of your profile’s content and uses that to determine how you show up in relevant search queries for your skill set. That score is raised by filling out all of the key sections of your profile: Profile Photo, Headline, Summary, Experience, Education, Skills, and Recommendations. The most emphasis is put on your Skills & Expertise, with the goal of using that information to connect you with people who have similar skill sets or employers looking for subject experts in those areas. It puts less emphasis on the things you have less control over, such as recommendations. Additionally important are your profile photo, headline, and two most recent positions – which are weighted heavily for keyword relevance and completeness. According to LinkedIn, including your two most recent positions increases your chances of showing up in relevant search queries more than 10-fold. Your resume and your LinkedIn profile serve different purposes. From a strategic perspective, they should be treated as different tools in your professional toolkit. More formal in tone and language, always written in 3rd person. Typically includes more detailed and granular information about accomplishments and key responsibilities. Is an outbound marketing tool that should be continually tailored to your target opportunity or employer. Needs to include the right language and keywords to ensure it is optimized for ATS (applicant tracking software) compliance. Can be created into multiple versions serving different audiences or focuses. Less formal and more flexible, able to accommodate a more narrative or casual first-person voice. Presents information in a more high-level structure, as it’s reaching a much broader audience. With hardly any formatting options, it lends itself best to more concise, single paragraph style layout. An inbound marketing tool and platform to which people searching for specific skill sets can find you, versus you soliciting them. Should also be regularly tweaked (but less often) in accordance with employment changes, new skill sets, titles, or areas of focus. Represents your digital presence within a much bigger platform that offers exclusive job opportunities, networking potential, and niche group conversations. One of the first entries to appear in search results when someone Googles your name, thanks to LinkedIn’s high SEO and site credibility. LinkedIn is a valuable tool for job seekers of all levels and industries. Having a polished, professional presence will increase your visibility. It’s not just an extra tool to supplement your resume, it’s the core foundation of your digital presence. And possibly the primary way hiring managers will find you. Ensure all sections of your profile are filled out with clear, concise, and keyword-driven content that speaks to your skill set and expertise. Connect with peers in your field, and ensure your resume and LinkedIn profile convey a consistent message around your experiences, skills, and value. Tags: career, job search, LinkedIn, resume. Bookmark the permalink.